All last week I shared stories from Clark Howard’s new book, Living Large for the Long Haul both here on My Financial Reviews and also on Couple Money. In case you missed them, here are six of my favorite stories from the book. I had a great time reading it because it not only shared numerous people’s stories on getting their finances fixed, but it gives you specific advice and tips on how you can use it on your own family’s finances. There are many people who are looking to get ahead with their money so they don’t have to live paycheck to paycheck. 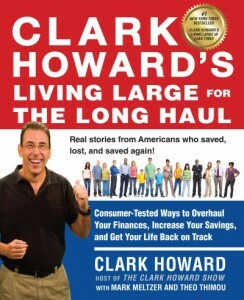 Howard’s book can be a useful tool in your arsenal. If you’re looking to grab a copy, you can find them at many retailers, but as a thank you to the community, I’ve received an extra copy to giveaway to one of you for free. If you’d like to win a copy of this book, just use the raffecopter widget below to enter. You have until this Sunday night (August 18, 2013) to sign up. Thank you again for being a reader and member of My Financial Review’s community!